There’s a lot to admire about your labour movement. 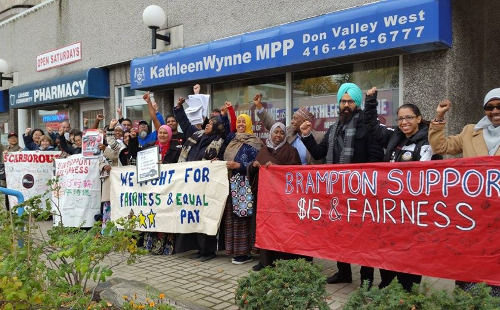 With community organizing, creative street heat, and militant strikes, you’ve just scored the biggest win yet in the Fight for $15, forcing a pro-corporate Ontario government to raise wages for 1.7 million workers and grant new card-check union recognition rights, paid sick leave, scheduling rights, and equal pay for temporary and part-time workers. That’s inspiring! Last year’s organizing victory of 1,000 casino workers in Vancouver stands as another glowing example of grassroots power-building. And hardly a season goes by when we don’t hear about yet another militant strike by construction workers, daycare workers, and others in Quebec, where union density stands at 40 per cent, four times the U.S. rate. That’s all the more reason for us to be shocked and worried to hear about the fratricidal split now unfolding within the Canadian house of labour. 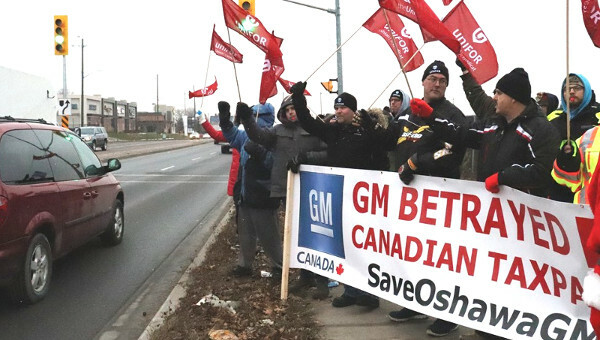 The leadership of Unifor, the largest private sector Canadian union, declared earlier this month that it is leaving the Canadian Labour Congress (CLC) over allegations that U.S.-based international unions are meddling in the internal affairs of their Canadian affiliates. 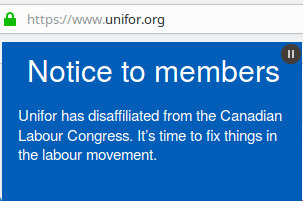 The internet is abuzz with talk of CLC retribution against Unifor. 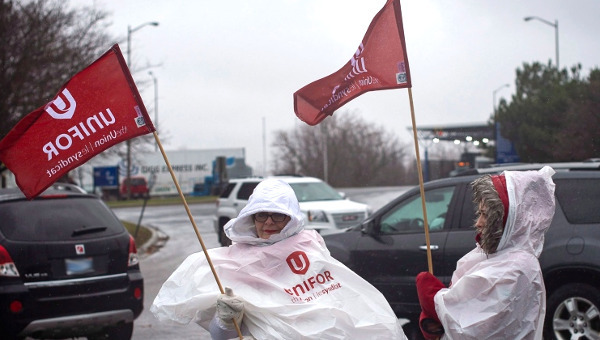 I’m not expert enough to parse through the reasons given for the Unifor-CLC split. I’m certain there are sensible arguments all around, along with deep-seated disagreements within the Canadian house of labour, as there are bound to be in any large and diverse federation. But a failure to resolve those issues and remain united would be catastrophic for workers all over. It would be a gift for big business. Those of us in the United States know this well – our unions went through a similar divorce a dozen years ago. It was calamitous. Stern’s critique of the AFL-CIO was spot-on. The federation indeed was not changing to meet the needs of today’s working class, and it was overdue for a shake-up. But his solution was disastrous. True, the breakaway labour group, Change to Win, led some important organizing initiatives like the 5,000-worker Smithfield packinghouse campaign in North Carolina. But we also went through a period of increasing inter-union raiding, such as the wasteful, stupid, and ultimately futile wars SEIU led against the hotel and restaurant workers union. Stern also got a taste of his own medicine when the leaders of SEIU’s big California healthcare local were ousted and formed a rival union that went on to successfully raid many SEIU groups. And as for Stern’s putative reason for splitting, that is, the need to organize more workers? In the decade since the breakup, U.S. unions lost nearly 1 million members and saw overall density drop from 12.5 per cent to 11.1 per cent. 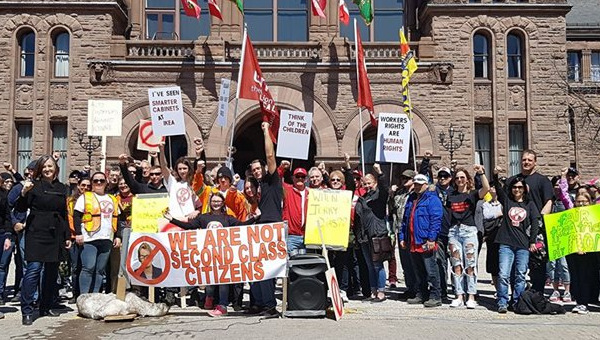 Workers inside and outside of unions, rather than seeing a labour movement unified to fight a hostile federal government and anti-union employers, grew dispirited to witness a movement so internally fractured. Why join this dysfunctional wreck? Rather than strengthening the U.S. labour movement, Stern’s split weakened it. And now in an enfeebled state, U.S. unions face the existential threat of Trump. There’s a principle I learned when I first joined the labour movement 35 years ago. Arguments are fine, even necessary to ensure internal democracy. When we’re caucusing amongst ourselves, we have knock-down, drag-out fights. But when the boss comes into the room, when we face off in our biggest fights against government or corporate power, we had better be unified. Or we all lose. Guess who is downright ecstatic over the Canadian labour split? Global corporations are on the march in 2018, remaking industries and entire countries to extract profits by maximizing human exploitation, misery, and suffering. They want to dismantle worker power, and are happy to see you fighting amongst yourselves instead of lining up to fight them. The CEO of Tim Hortons is surely delighted to know that every ounce of energy you spend fighting one another is energy not spent countering the company’s serious attack on your historic $15 win. The executives of the global hotel chains, auto manufacturers, construction firms, and financial institutions that operate in your country, my country, and others are doubtless salivating at the prospect of exploiting this split in the Canadian working class. No, problems don’t get fixed by disengaging, and today’s worker movement won’t get stronger through subtraction. This article first appeared on the alternet.org website.